Been gone on the National Network since 1985 (D200 lasted until 1988 as a Celeb).Several in preservation and at this time one working occasionally on Specials on the mainline again. 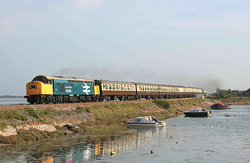 Class-40 D213 'Andania' looks really immaculate sitting in the late afternoon sunshine at St Philips Marsh. 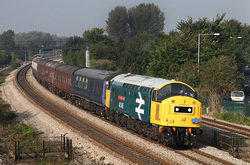 A gleaming '345' powers non-stop through Moreton in Marsh with '1Z41' returning to Castleton-Hopwood from Oxford (16:50 departure).After a pretty dire start to the day the clouds finally behaved to produce this excellent shot of the 'Whistler'.Suddenly the whole day seemed rather worth the effort! In a brief patch of rising weak sunlight '345' rolls out of Sapperton Tunnel going to Oxford from Castleton.The tour '1Z40' carried an apt headboard 'The East Lancs Stalwart',refering of coarse to the venerable machine doing the haulage.The loco certainly looked good in its recently applied coat of authentic Rail-Blue.I know it looked good in Large-Logo but as we all know that colour scheme was just a fantasy as far as 40's were concerned. 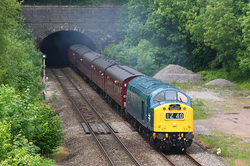 '345' bursts out of Sapperton Tunnel with '1Z40' the 06:39 from Castleton-Hopwood going to Oxford.This location is north of Kemble on the 'Golden-Valley' Standish-Jnc to Swindon line. 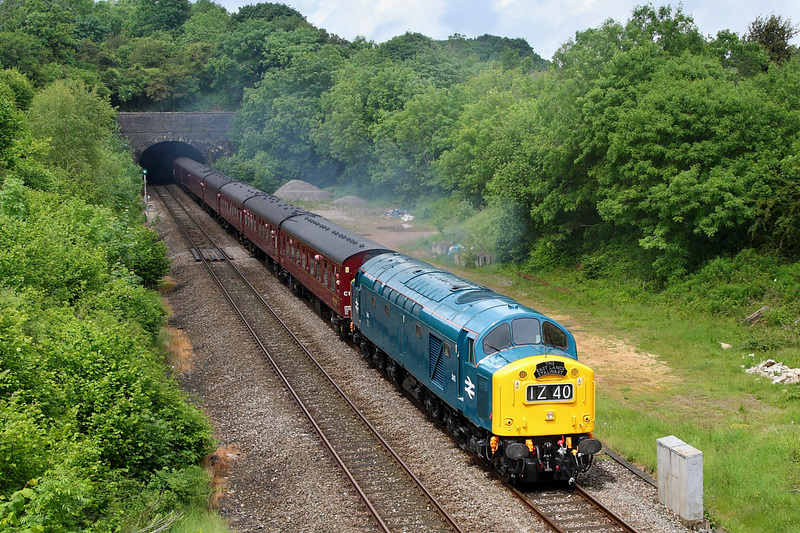 Pathfinder-Tours The Torbay Whistler '1Z40' 06:29 from Tame-Bridge Parkway going to Kingswear in Devon passes Undy with 40135 in charge.Nice to see this pregnant '37' in its ficticious Large-Logo Livery even if it is non historical! 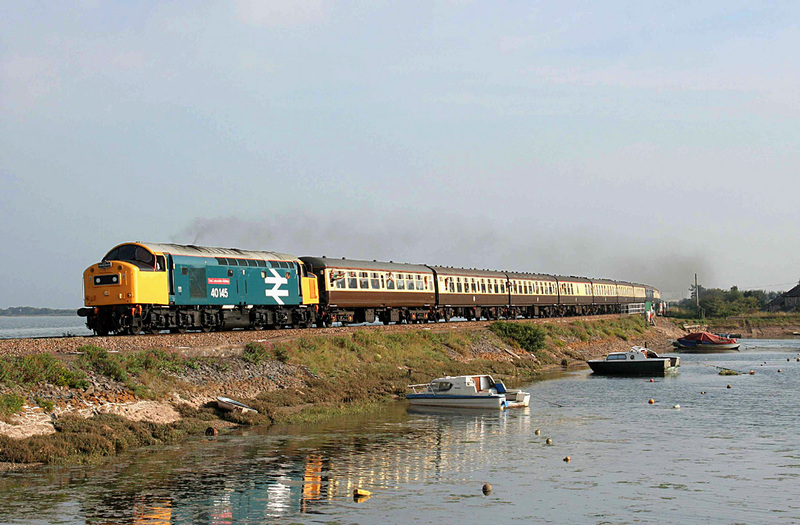 40145 (D335 old old money) in ficticious Large-Log-Livery passes Cockwood Harbour at Dawlish with '1Z56' from Kingswear back up to Banbury.A Tour operated by Pathfinder Tours.Note the the lack of ridiculous H&S fencing now installed here totally ruining this iconic location for photographs! 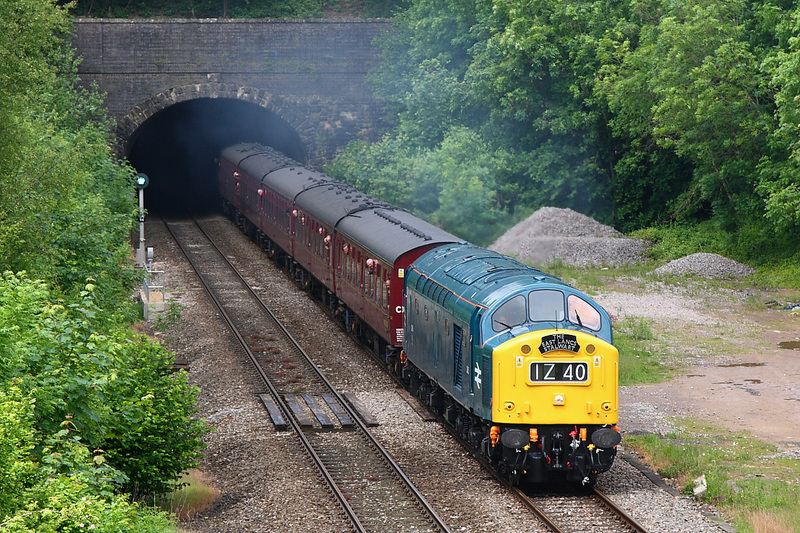 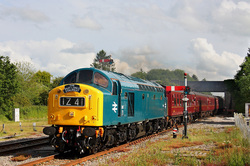 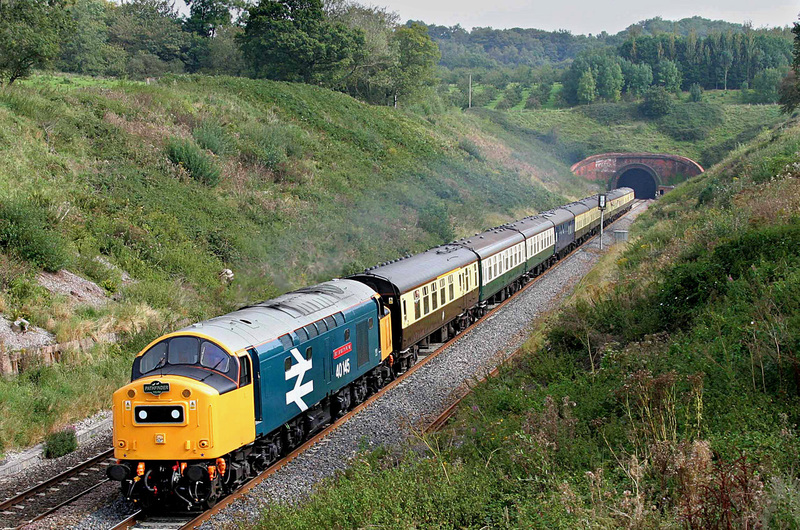 40145 c/w fake Large-Logo styling emerges from Whiteball Tunnel with '1Z55' the 06:39 from Banbury going to Dartmouth.This Pathfinder organised Railtour was marketed under the name of 'The Devonian' which years ago was an official title given to an express on this route. 40122/D200 sits in Basingstoke about to depart to Andover with the 'Ludgershall Limited' running as '2Z18'.In the next platform was sitting '2BIL' 4090 part of the National Collection that was running shuttles from Woking to Basingstoke.To my shame I didn't even really notice it! 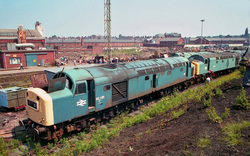 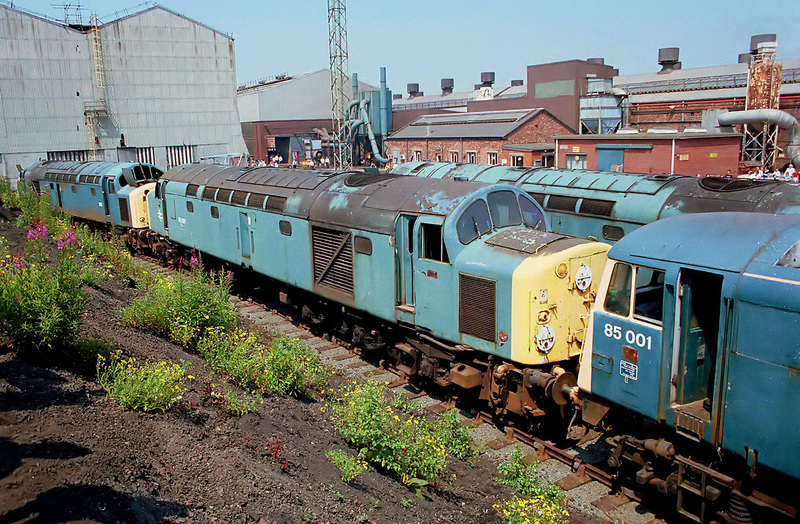 40091/40195 and 85001 stand in the sidings at Eagle Bridge in Crewe-Works waiting the call into the 'Melt-Shop' to be broken up for scrap.The AL5 formally E3056 was eventually transferred to M C Metals in Glasgow for the final rites. 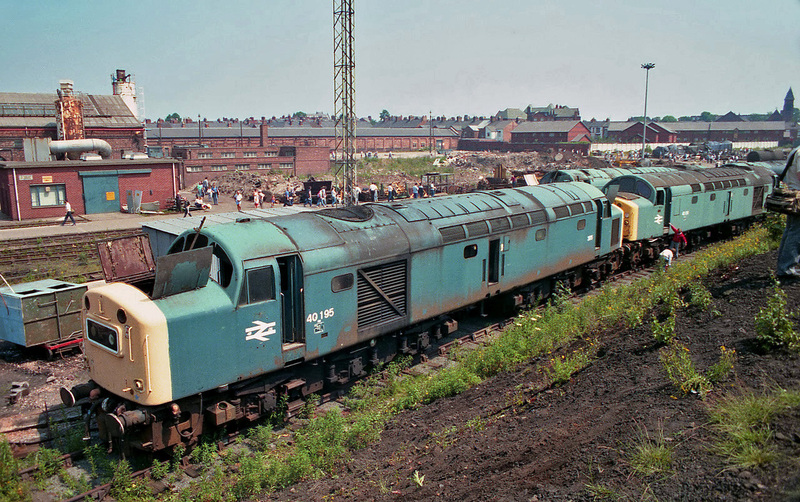 The large buildings behind the 40's on the left is actually the 'Melt-Shop' where the breaking up of locomotives took place under cover. 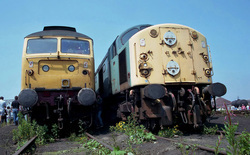 Two more for the Melt Shop to dismantle.40195 and 40091 sit waiting their fate in Crewe Works now that they were surplus to requirements.These two were actually the last members of the once 200 strong class to be dismantled here.The total cut up on this site was 65 altogether,the most anywhere in one location..Happily seven still exist in 2013 in preservation so the famous whistle live on! 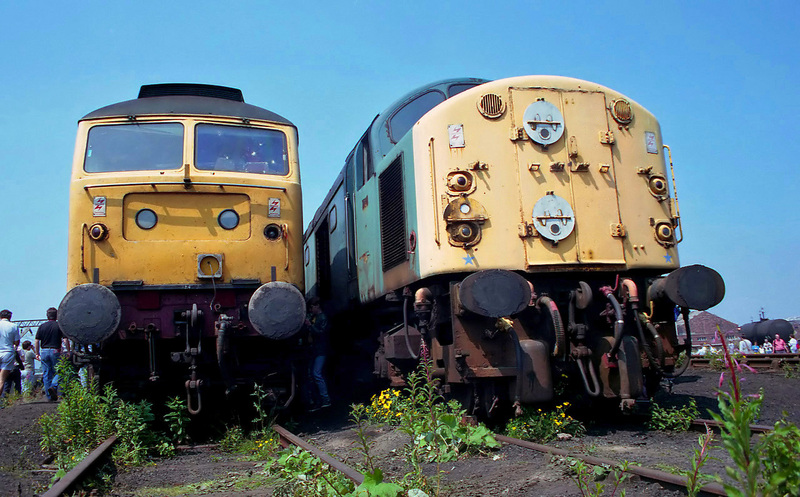 A nice pair,regretfully both now discarded as surplus to requirements.47409 originally D1508 was taken out of service in August 1986 and eventually died at Vic Berry's in Leicester.The other machine was 40028 and it once carried the name 'Samaria', a Cruise Ship of the Cunard-Line.The Loco suffered the same fate as its namesake and went for scrap as well.Coming out of use in November 1984 and getting the chop just six months after this picture here at Crewe was taken. 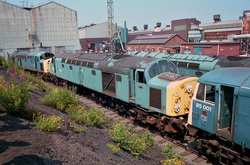 Both engines are seen in the scraplines near Eagle Bridge at the eastern end of the Works. 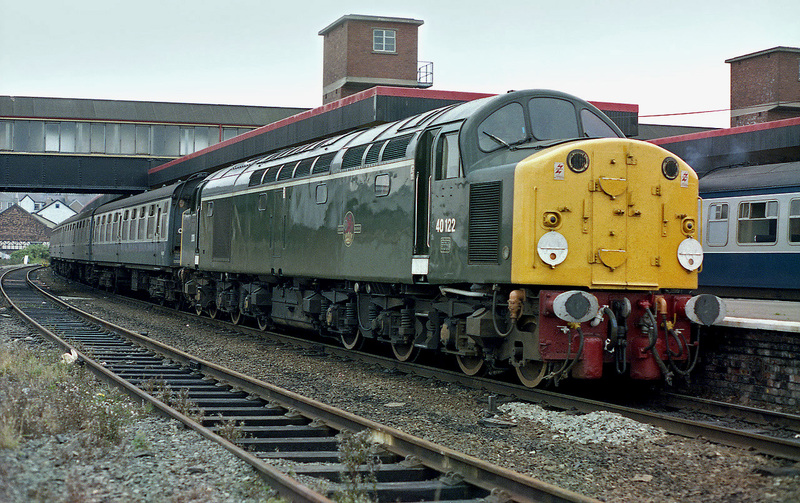 This diagram was apparantly known as the 'SX Stoke-Llandudno Return' It ran to Llandudno-Junc then did a 'fill-in' trip down to Bleanau-Ffestiniog and back before returning to Stoke on Trent. 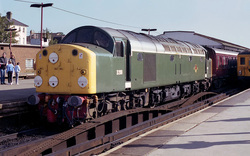 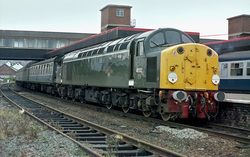 Here 40122(D200) is seen at Llandudno-Junc waiting time after returning from Bleanau.This section of the rota being '2D18'. 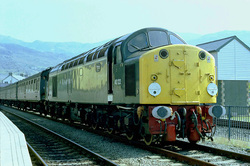 D200/40122 having a rest at Llandudno-Junction before running round to form '1K38' back to Stoke on Trent. 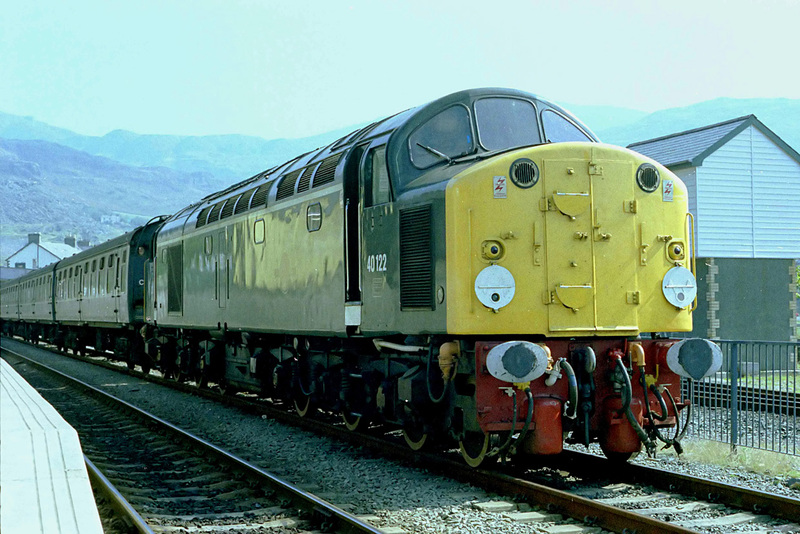 D200/40122 stands at Bleanau-Ffestiniog ready to work the return working to Llandudno-Junction '2D18'.Rescued from certain scrapping earlier in the 1983 with the help of 'Rail' D200 was used on mundane work such as this in between Charter and Railtour Duties. 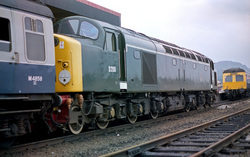 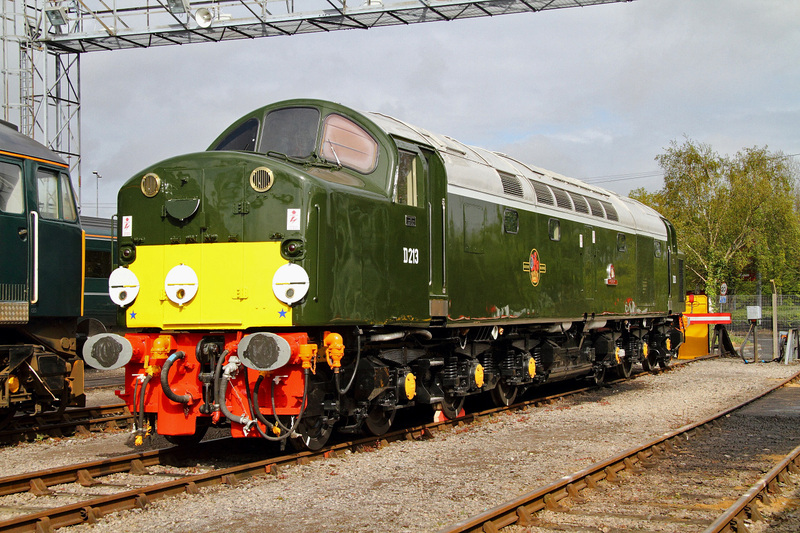 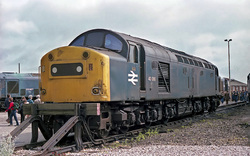 This loco started life as D226 and was the only engine in the series D210 to D235 not to carry a name when first introduced on the WCML working out of Euston.It was actually allocated the name 'Media' but for some reason the plates were never fitted.Anyway it is all academic now for 40026 for despite looking virtually complete was due for component recovery then scrapping here at Swindon.This duly took place by September 1983. 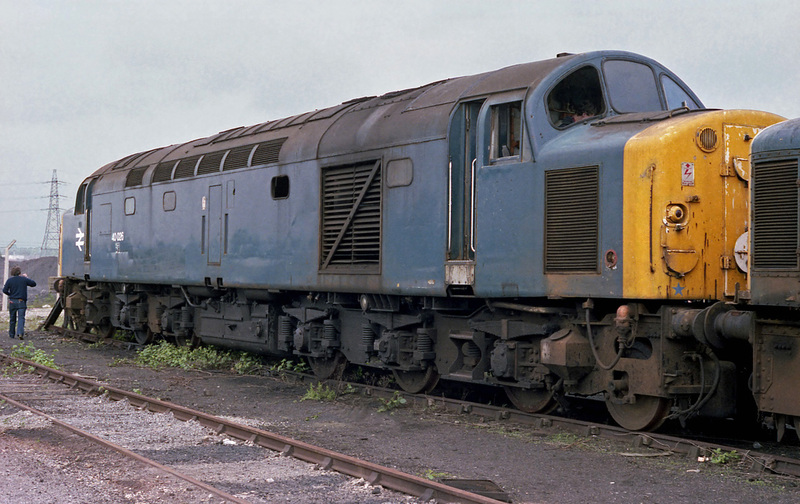 This ex-scottish EE Type-4 40066 easily recognisable by its 'Centre Headcode Box' modification lies in Swindon -Dump awaiting the chop.It lasted until October just 4 months later before being reduced from what you see here,a seemingly perfectly servicable locomotive to a pile a scrap! 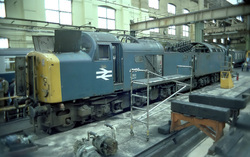 This particular Rail-Blue EE Type-4 40109 (originally D309) stands inside Swindon-Shops being systematically stripped of components to keep the fleets of 20's/37's and 50's going.Things like cylinder-heads,turbo's and various auxiliary parts being all interchangeable with those classes.After this the gutted shell would be dragged down the west-yard for final cutting up for scrap.For this loco the end was a few weeks away,by the end of the month it was gone.